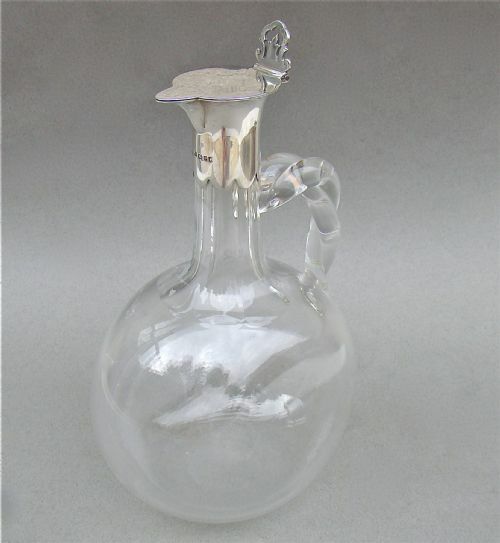 This stunning Victorian silver plated claret jug has the most exquisite and unusual glass body. Of elegant tapered form, the moulded glass body acid-etched with anthemions and geometric patterns. The engraved silver plated mount with a domed cover and an elaborate handle. The spout with conforming scroll decorations. Diameter at widest: 13cm / 5.2 inches. Glass neck in pristine condition. Silver plated mount in excellent good condition, with no base metal showing through. 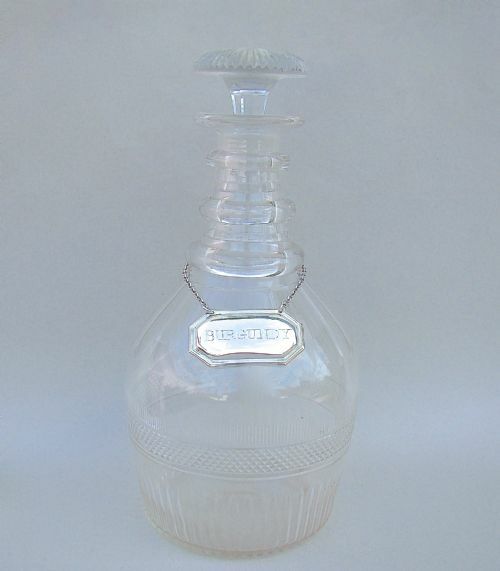 This is a stunning cut glass decanter dating circa 1800. The mallet-shaped body with elegant sliced-cut vertical slats and a band of hobnail cuttings at the centre. Thumb-cut shoulders and sliced-cut triple neck. Sold with a rather rare Old Sheffiled plate Burgundy wine label. Height: 25cm / 10 inches. Diameter at widest: 13cm / 5 inches. Postage overseas: No overseas postage. This is a delightful Georgian silver decanter label FOR PORT. 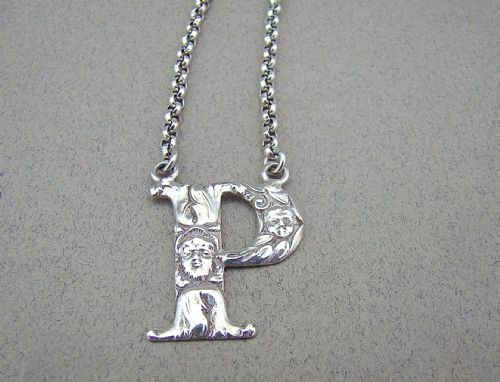 The letter P embossed to the front with a cherub and Bacchus amongst foliage and suspended on a belcher link chain. On the reverse, the hallmarks are beautifully clear. Date letter "D" for 1827. Letter Height: 2.5cm / 1 inch. Total length with chain: 12cm / 5 inches. Please not, This label comes with a matching Whisky and Gin label, if purchased together, I can offer a discount in the price. 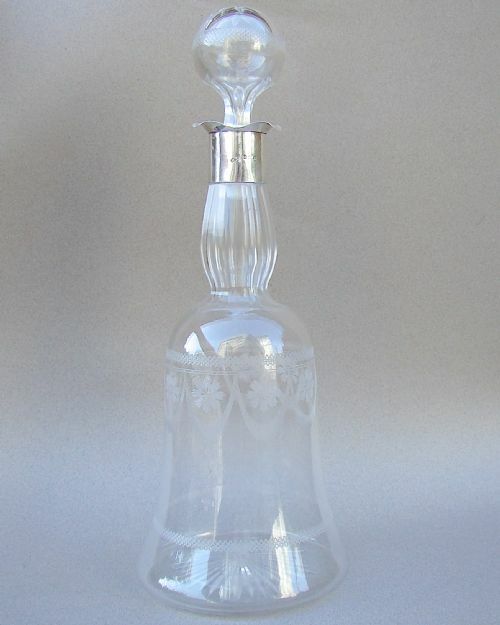 This exquisite silver mounted glass liqueur or wine decanter is very typical of the Edwardian era. The unusual bell-shaped body with sliced-shoulders is wheel-engraved with garlands of flowers. 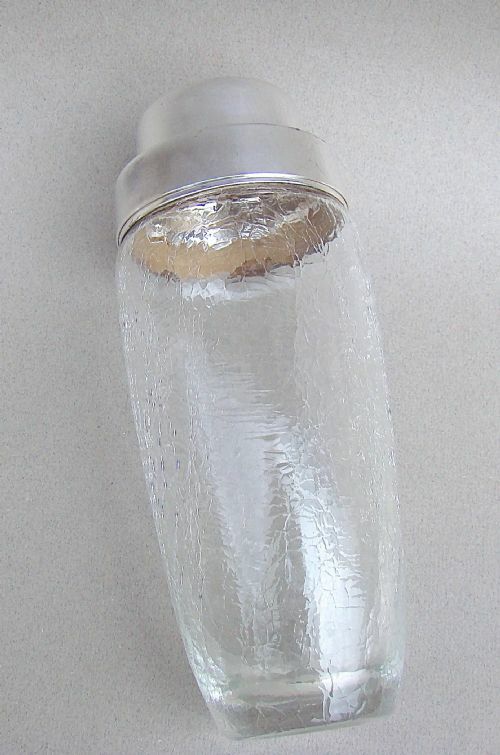 The flared silver neck fitted with the original hollow glass stopper. MJJ for Matthew John Jessop. Date letter "b" for 1901. Height: 30cm / 12 inches. Base diameter: 11cm / 4.2 inches. Postage UK: £8.00 First class. Postage overseas: £15.00 International standard. 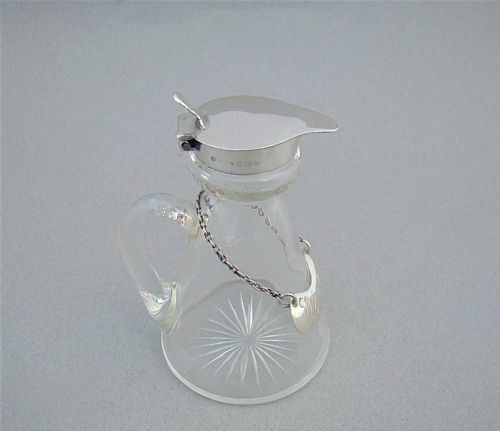 This is a very decorative Art Deco cocktail shaker by the collectable German firm WMF. The crackle glass body mounted with a silver plated neck and pull off top. The neck incorporating a removable strainer. This is an elegant silver mounted glass whisky noggin made in Birmingham 1926 by the prolific S. Blanckensee & Sons Ltd.
Silver mounted collar. It comes with a silver tot label by the same maker but an earlier date. SB&SLD for S Blanckensee & Sons Ltd. Date letter "m" for 1937. Silver and glass in very good condition. Base diameter: 6.5 cm / 2.4 inches. This is a delightful mid-Victorian silver cut out "Rum" label. 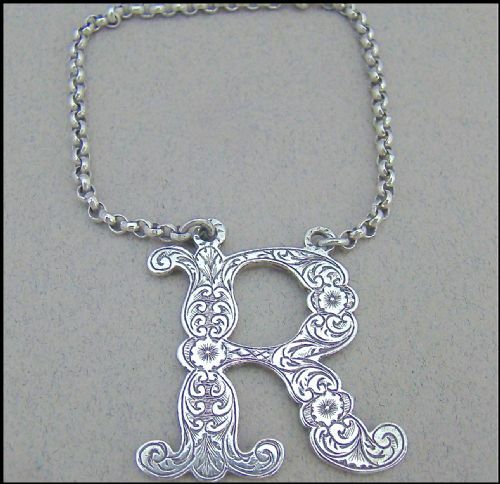 The letter R engraved with foliate decorations and suspended on a belcher link chain. CR over WS for Charles Rawlings & William Summers. Date letter "l" for 1861. Letter Height: 3.5cm / 1.3 inches. Length of chain: 15cm / 6 inches. To pay by credit or debit card over the phone or by cheque, please contact me on 01449 760 585.irmingham Assay mark. Date letter "z" for 1874. Total length with chain: 10cm / 4 inches. 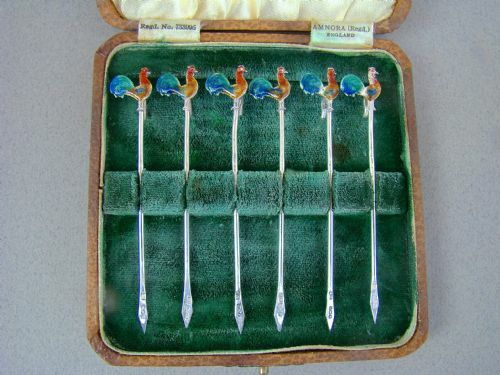 This is a rare and exquisite set of enamelled silver cocktail sticks . Each stick decorated with a polychrome enamel cockerel and mounted on a fully hallmarked stem. Fitted in their original case. A.S for Adolph Scott Limited. Date letter "N" for 1937. Impressed: "BRITISH MAKE" at the back of each cockerel. Two cockerel with slight losses to the enamel. This fabulous quality sterling silver fox stirrup cup* is hallmarked for the Royal Irish Silver Company and is dated Sheffield 1970. The trumpet shaped cup terminating in a naturalistic modelled fox head with finely textured fur and mouth partially ajar. The cup typically resting on the fox's ears. It has an excellent silver gauge and a bright gilt interior. * Stirrup cups were for the pre-hunt drink, usually a port or sherry, offered to a member of the hunt. 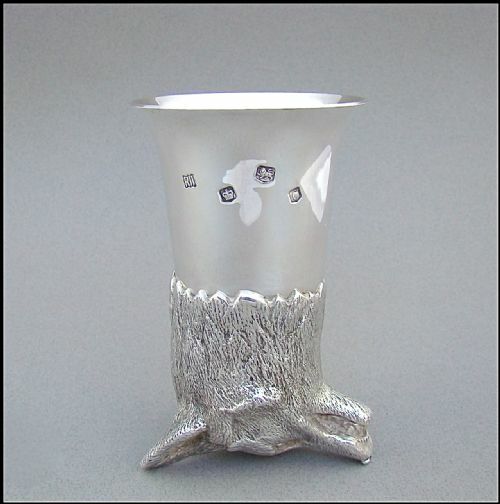 RII for the Royal Irish Silver Company. Height: 12cm / 4.5 inches. Diameter: 7cm / 2.7 inches. Weight: 11 1/4 oz / 319g. This is a superb late Victorian silver plated decanter stand fitted with three fabulous Bohemian overlay glass decanters. 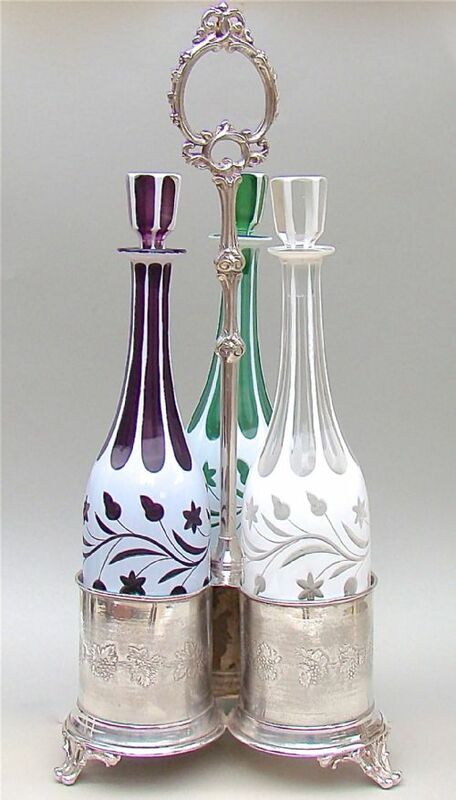 Each decanter a different colour, having a white opaque body cut to clear and coloured glass with decorative trailing acorns. The silver plated stand engraved with fruiting vines and having a beautifully ornate central carrying handle and raised on three decorative bracket feet. Stand height: 46cm / 17 inches. Stand width: 20cm / 7 inches. Stand depth: 20cm / 7 inches. Bottle height: 33cm / 7 inches. Base diameter: 8cm / 3 inches. All decanters in excellent condition. The green stopper with minor chip as seen on image. Stand in very good condition, with no base metal showing through, just minor unevenness, commensurate with age. This fabulous double coaster decanter wagon or wine trolley was made circa 1820. The stand, holding two coasters, is mounted on four spoked wheels, has an articulated mechanism and a swivelling handle. These wine trolleys were used in more formal occasions to pass the wine from guest to guest down a long table*. The two wine coasters have decorative applied borders cast with shells and surmounted by two cherubs. The turned fruit wood bases have silver buttons. The undercarriage is well made and operates smoothly. The swivel handle is beautifully cast. *According to Bradbury the trolley was invented in the early 1820 by Sir Edward Thomason, acting upon information received from Lord Rolle who had dined with King George IV. The King, apparently, "regretted that his noble guests who sat on either side of him were constrained to rise from their seats to pass the wine" and said to Lord Rolle "As you have said that you are going to Birmingham tomorrow, you had better call upon Thomason who may invent some plan to obviate this inconvenience. 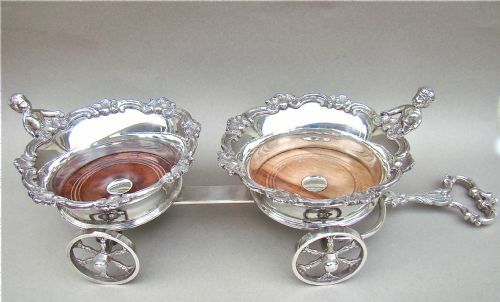 The trolley is shown on the last images with a pair of early Victorian decanters that can be purchased separately. Diameter of coasters 17 cm/ 6.4 inches. 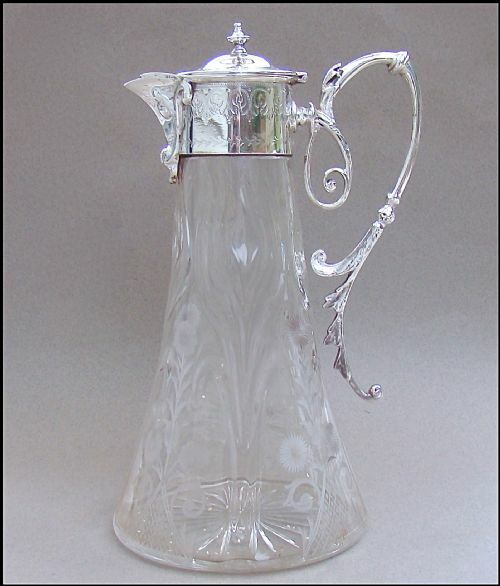 This is an exquisite Victorian silver mounted claret jug made by the prolific Atkins Brothers and dated Sheffield 1882. The main body of bulbous form with an elegant faceted neck and tactile wrythen handle. The scalloped silver collar with a flat hinged lid and scrollwork thumb piece. No damage to glass and glass neck. Silver neck in wonderful condition. Postage UK: £15 Special Delivery Next day.